Andy Seaman and Alex Capaul struck up a friendship the summer before their freshman year in high school. That’s the year the right-handed pitchers played on the Spokane Dodgers select team. It’s the only year they played together. 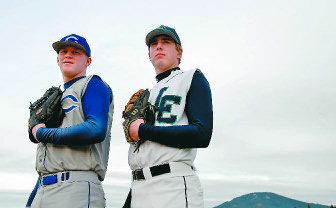 They’ve remained friends even though Seaman went to Coeur d’Alene and Capaul went to Lake City. Although the schools wage spirited battles in most sports, including baseball, Seaman and Capaul haven’t let the rivalry taint their friendship. This will be the third spring they’ve gone head to head on the mound as varsity starters. Asked what their head-to-head record is, it didn’t take long for either to come up with the answer independent of the other. They agreed on 2-2. LC is seeking a trip to state for the first time since 2004. CdA’s state drought has been longer. The Vikings haven’t been since 2001. The Vikingss have come close the last two years, defeating LC in loser-out games and advancing to the play-in game for a state berth. But they’ve lost both times to Centennial. Lewiston, the Region I champ the last two years, captured the State 5A title last spring. The Bengals return six starters and are tabbed the preseason favorite in the Inland Empire League. So the Vikings and Timberwolves know it won’t be an easy task trying to snap their respective state-trip droughts. To that end, LC and CdA will rely heavily on the proven arms of Seaman and Capaul. LC coach Cory Bridges has high expectations for Capaul. Although this is their final high school season, they will head to college to continue their careers. They couldn’t have picked locations further apart. Seaman is headed to the East Coast to attend the U.S. Military Academy while Capaul is going to the University of Hawaii. Seaman will leave for West Point, N.Y., in early July. Capaul plans to play one more summer for the Coeur d’Alene American Legion team before leaving in August for Hawaii. Seaman and his family moved to Coeur d’Alene from Alaska after his eighth-grade year specifically because of baseball. “My dad knew that I had what it took to play college baseball, but he didn’t think I’d get the chance living in Alaska,” Seaman said. West Point began recruiting Seaman his junior year when it saw him at a fall tournament in Arizona. About a month after having been contacted, Seaman took an unofficial visit to West Point and soon thereafter gave the academy an oral commitment. That launched what turned out to be more than a year-long process of earning an appointment to the school. Seaman had to pass a fitness test. The combination of his grade-point average and college-entrance test scores had to meet Army standards. He had to be nominated by a congressman or senator. He ended up securing nominations from three, although he only needed one. “It was a long litany of things,” Seaman said. Seaman finally signed his letter of intent last month. His commitment to the Army includes five years of service as a commissioned officer after he finishes at the academy. “It’s the Army’s way of you paying them back,” Seaman said. The only thing that would postpone or interrupt it is if Seaman were drafted – as in the major league draft. Capaul initially had an interest in the academy, too. But his decision was made much easier when Hawaii contacted him. A visit to Honolulu and being in the warm climate made the choice simple. The pitchers are looking forward to facing each other a couple of more times this spring. The first opportunity will be Wednesday in a single game at LC. The teams will play one other single game and one doubleheader, so it’s possible that Seaman and Capaul will square off as many as three times and perhaps four if the teams meet at regionals. The players also have respect from the coaches of the rival schools. Seaman is 14-5 overall and 3-0 in CdA’s 6-0 start this spring. Capaul is 8-7 overall and 1-0 in LC’s 4-0 start. Capaul threw a no-hitter against CdA last year. Capaul and Seaman could only recall getting one hit off each other. Capaul’s was a lazy blooper over the first baseman’s head and Seaman’s was a double over the center fielder’s head. Both hits came last year. Both agree that Lewiston is the favorite. But they wouldn’t be surprised if the Bengals get knocked off. If it’s not their team knocking off Lewiston, then they figure it will be their friend’s team.